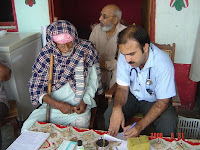 The Rotary Club of Lahore Garrison organized a free medical camp at Tarogill village off Raiwind Road, which provided free of cost treatment and medicines to more than 300 patients. Rotarians led by President Aslam Chaudhry spent the full day at Tarogill village and actively participated in the Medical Camp. Rotarians Dr. Rizwan Vohra and Dr. Sakhiyya Sakhaullah along with other doctors and dispensers provided their expert services. 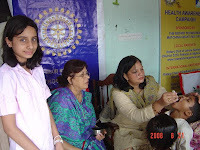 Innerwheel Club and Interact Club of Lahore Garrison members also actively participated in the Medical Camp. The Innerwheel members took responsibility of administering polio drops to children and provided polio vaccine to about 100 children. The Interact club kept the village children busy by asking them general knowledge questions and presenting them with small gifts and candies. Seventy five saplings were also planted in the village as part of the ongoing tree plantation campaign. District Governor Nominee Shehzad Ahmed, Charter president G.R. Siddiqui, Interact Club Secretary Fatima Shehzad, Innerwheel members Dr. Maimoona Ali, Shama Shahab and Khalida Idrees were present at the camp. The medical camp is part of the health awareness campaign being carried out by the Rotary Club. Al-Raheem Free Dispensary at Raj Garh has also been adopted through this program. 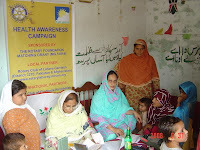 LAHORE (September 13, 2008): The Rotary Club of Lahore Garrison as a part of its health awareness campaign, organised a free medical camp and provided free of cost treatment and medicines to over 300 patients. The Club's president Aslam Chaudhry along with doctors and paramedics provided their expert services at the camp that was organised in a village at Raiwind Road. Innerwheel Club and Interact Club of Lahore Garrison members also actively participated in camp. The Innerwheel members took responsibility of administering polio drops to children and provided polio vaccine to about 100 children. The Interact club kept the village children busy by asking them general knowledge questions and presenting them with small gifts and candies. Seventy-five saplings were also planted in the village as part of the ongoing tree plantation campaign. 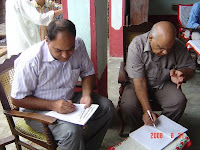 District Governor Nominee Shehzad Ahmed and other office bearers were also present on the occasion. LAHORE: The Rotary Club of Lahore Garrison provided free of cost treatment and medicines to more than 300 patients in a medical camp established at Tarogill village off Raiwind Road. The camp was led by President Aslam Chaudhry who spent the entire day at Tarogill village and actively participated in all activities. Dr Rizwan Vohra and Dr Sakhiyya Sakhaullah along with other doctors and dispensers also provided their expert services. 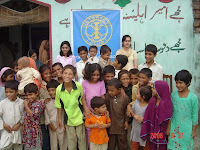 Members form Innerwheel Club and Interact Club of Lahore Garrison also contributed their efforts. Innerwheel members took responsibility of administering polio drops to children and provided polio vaccines to about 100 children. Interact club kept the village children busy by asking them general knowledge questions and presenting them with small gifts and candies. Seventy five saplings were also planted in the village as part of the ongoing tree plantation campaign. Clubs District Governor North Shehzad Ahmed distributed the limbs in a function. of Ramadan and some 50 amputees have been registered under this project. Khalid Ghurki appreciated the Hope Societys efforts for the rehabilitation of disabled.